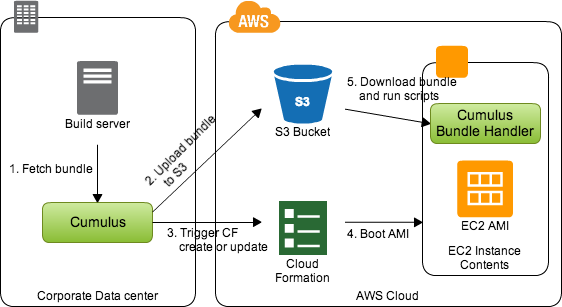 Cumulus is a deployment suite used to deploy and manage environments built with AWS CloudFormation. Cumulus will help you bundle your code and configuration and unpack the bundle to new instances on CloudFormation. The target for the Cumulus project is to make cloud deployments scriptable, reliable and repeatable. It is of great importance for productivity and product stability that you are able to release often and with as few manual steps as possible. Cumulus consists of two parts, cumulus which is used to manage the software bundling and deployment and the cumulus-bundle-handler which handles the software installation on the target servers.